Generally when I see a book has been written by two authors, my expectations go way down. Writing seems like such a solitary activity; I imagine a collaboration to read like two sports announcers vying for the microphone during overtime. Husband and wife writing duo Tom Franklin and Beth Ann Fennelly, however, avoid the ESPN factor in The Tilted World, their historical novel about the catastrophic 1927 flood of the Mississippi River. Their two main characters are on opposite sides of Prohibition laws: Ingersoll is a revenuer, deputized by the federal government to root out and arrest those involved in the illegal production and distribution of alcohol, while Dixie Clay is a bootlegger, running the still and perfecting the recipe while her husband Jesse does the wheeling and dealing. But theirs isn't just a simple game of cat and mouse—it's complicated by an orphaned baby, a couple of revenuers who are missing and presumed dead, and of course by the mounting floodwaters that threaten the tiny town of Hobnob, Mississippi and most of the South besides. Oh, and their undeniable attraction to each other. Fennelly is a poet, and I have to assume many of the lovelier prose passages are thanks to her skill. Feisty, resourceful Dixie Clay is an incredibly likable character and another highlight for me. I was rooting for her the whole way, lawbreaker or no. I also appreciated the historical detail Franklin and Fennelly managed to shoehorn into the narrative, as I didn't know such a large swath of the country had ever been flooded. The authors claim it's no surprise the flood has been largely forgotten, as it wasn't even taken seriously by President Coolidge at the time it occurred, bringing to mind more recent natural disasters and the subsequent inadequate response of the federal government. If I have one complaint about the book, it's probably that the ending is too tidy for my taste. I'm certainly not against a happy ending, and I believe a book can be considered “serious” literature even if its characters don't all come to horrible ends, but in this case I felt some nuance was lost in service of happily ever after, particularly in regard to the orphaned Willy finding a new family. My experience with foster care tells me that even if an orphaned child is adopted into a loving and stable family, the loss of the birth parents doesn't just magically go away. It makes me a little cranky when books gloss over the layers of complication that come with child abandonment and adoption. 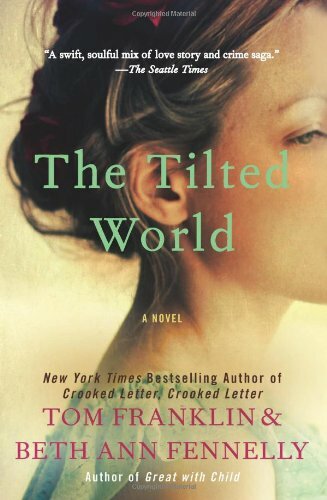 Nitpicking aside, though, The Tilted World would be a solid choice for fans of historical fiction and romance.